To some degree this is a review of an app rather than a book. I started using the Headspace app a couple of months ago after a particularly trying burst of insomnia. The Headspace Guide to Mindfulness & meditation by Andy Puddicombe is the book of the app, I picked up the Kindle version for £0.99. The mindfulness / meditation division is a bit of language engineering. Meditation is the exercise you do to achieve a state of mindfulness but also when Western medical practitioners were starting to use techniques of meditation in treating patients they found greater acceptability in the scientific community when using the newly coined term “mindfulness” rather than “meditation”. 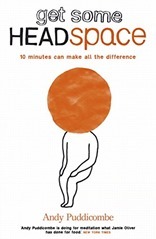 The Headspace app costs £60 per year, more if you pay by month and less if you buy for longer. There’s much more material in the app than in the book but I find it easier to read chunks of text rather than remember the preambles to the guided meditation sessions which is where the material from the book is found in the app. I think it’s pretty much the only app I’ve bought and I had it on a free trial first – so I certainly value it. 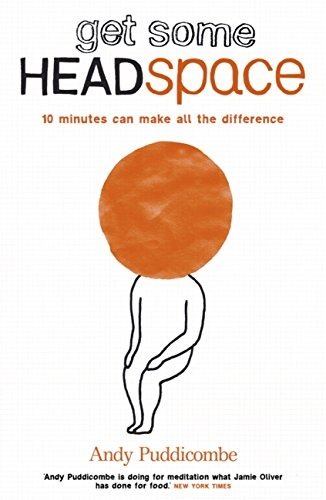 The core of the Headspace programme is the 10 minute daily meditation. This starts with a few deep breathes to get yourself going, some scanning of the body to gain awareness of your physicality, followed by a period of focusing on your breathing and then a phase of returning to the world. Clearly, this brief description does not do the process justice. From my mechanistic point of view, the “aim” is to become a dispassionate observer of ones thoughts – mindfulness. More widely is carrying this approach in to the rest of your day. In the app the voice of Andy is a comforting presence; perhaps more so for me because he’s from the West Country, and so makes me feel at home with his very slight Bristol accent. I found the app made it very easy for me to stick to a regular programme of daily 10 minute sessions. I think one of the things that helped me latch on to Headspace was the exercise for insomnia, not so much the exercise itself but the fact that Andy describes exactly the form my insomnia takes (it’s also repeated in one of the case studies at the end of the book). Essentially I go to bed, and for an hour or so I fail to fall asleep. At which point I start getting stressed and frustrated at not falling asleep, and worrying about how awful the following day is going to be without any sleep. Usually the thought that set me off not sleeping is also going around and around in my head as well. At its worst this continues through the whole night. The book is very readable much of the book is anecdotes of Andy’s time spent in monasteries, although there are some exercises and written guidance for meditation. This may seem frivolous but I found it far more interesting than dry descriptions of meditation, and as a result more likely to stick in the mind. I found these stories, and other visualisations described, very helpful. There are frequent references to scientific research on the benefits of meditating and mindfulness through the text, as a trained scientist I muttered about the lack of in-text citations but on reaching the end I discovered the references section which, without following them up, look legitimate. I learned a couple of things from reading the book compared to the app, it turns out my sofa is considered a bed for meditating purposes so I should be using a dining room chair. Secondly, it seemed implicit in the app that meditating was best done in the morning and the book makes this explicit. Strangely I find that elements of mindfulness existed in my life before I got Headspace. When I’m running (at my best) I find myself focusing on my breathing, in fact I can tell I’ve been thinking rather than focusing on breathing because I run slower when I’m thinking. I found a similar experience when we used to go walking in the countryside, the tramp of the feet acts as a good focus. Meditation has its roots in Buddhism, and much of the experience that the author relates is from monasteries and his time as a monk, despite this the book (and the “programme”) feel like they have no religious elements to them. It has to be said adherents to meditation can sound rather evangelical – I can feel myself doing this now. In summary, I highly recommend giving meditation, and Headspace a go. You can try the app for free for 10 days, or if you prefer the book is very cheap in its Kindle edition. I’ve been struggling a bit with the story of PiP and the breast implants, because every time radio presenters say “French-made breast implants”, I hear “French-maid breast implants”. The BBC has a useful Q&A on the subject here. Essentially the problem is that PiP manufactured breast implants using industrial rather than medical grade silicone, subsequently there have been reports, initially in France, that the rupture rate of these implants is significantly higher than expected. There is no evidence that the implants lead to an increased risk of cancer, given the prevalence of breast cancer it isn’t surprising that some patients with the implants have gone on to develop cancer. The striking thing is that the implants were banned for use in 2010 because they were found to be using industrial grade silicone gel, surely it was at this point that they should have been recalled (i.e. the decision made to remove those already implanted)? The situation in the food industry is quite different: if a company discovered that one of its suppliers had provided non-food grade ingredients then the product that the company made would be withdrawn from sale pretty much immediately. There would be no waiting around to see if the ingredient was actually hazardous, it would be withdrawn on the grounds that it was out of specification. I’m pretty sure similar applies in the car industry, and the aviation industry. I know this because Mrs S used to work in the food industry; food scares on the morning news always led to an exciting day at work as every retailer sought confirmation that the company she worked for did not use any of the products involved in the scare. Food companies trading legally would have this traceability information. Healthcare does offer a slightly different scenario, in the sense that carrying out an operation to remove breast implants does carry a risk which means there is a downside to removal, but this is the only relevant consideration: all other things being equal the implants should be removed, by the original installer where possible. Some people seem to feel that women having breast implants have brought this on themselves, that they shouldn’t be helped on the NHS. Clearly the first port of call for removal is the installer but there are cases in which the installer no longer exists; the NHS is a universal service – if someone has a qualifying medical problem then regardless of how they came by it (excessive eating, drinking, drug taking, climbing, skiing) they are treated free of charge. The same should apply to people who have medical problems arising from surgery outside the NHS – the liability is with the original supplier but sometimes they no longer exist, the patient should not be punished for this. A UK Breast Implant Registry was established in 1993 on the recommendation of the Department of Health to track implant patients’ health, but it closed in 2006 as too few women wished to take part in the scheme. The final report of the UK Breast Implant Registry is here, and the MHRA confirms that the scheme closed because too few patients would consent to remain in long term follow-up here. This would seem to be the significant factor in this case: there is some follow-up for medical devices but it is voluntary and in the case of breast implants the uptake rate for follow-up was not considered high enough to warrant continuing the process. It still leaves the question as to why the removal of breast implants made from out of specification materials is not assumed, except for considerations of the safety of the removal operation.